Tina Joemat-Pettersson: A "Walking Disaster"! The Business Day Editorial provides this gem of an opinion on our impressively contemptuous, damaging and destructive Minister of Fisheries (and Agriculture). “THE African National Congress (ANC) has repeatedly said there should be no “holy cows” at Mangaung, yet there are clearly subjects — and individuals — that are considered above criticism or official reproach. Apart from the obvious example of President Jacob Zuma and his heavily subsidised domestic arrangements, another is Agriculture, Forestry and Fisheries Minister Tina Joemat-Pettersson who, if not a holy cow, at least appears to be royal game. How else could any Cabinet minister have survived the series of bungles she and her department have committed in recent months? The woman is a walking disaster area, not to mention political liability, yet there is no hint from the Presidency that her job may be on the line. Contrast that with the fate of party members who have been silly enough to cross Mr Zuma or defy the ANC line over the years. Ms Joemat-Pettersson’s latest ill-considered act is her response to the public protector’s finding that she violated the executive ethics code, wasted taxpayers’ money and “displayed a blank-cheque attitude towards public funds”. Rather than accept this slap on the wrist, Ms Joemat-Pettersson issued a statement rejecting the “media perception” that she is extravagant “with the contempt it deserves”. She is correct — there is contempt involved, but it comes from her and is aimed at the public. Some in the ANC struggle more than others to hide their irritation at having to tolerate somebody who is so obviously unsuited to a Cabinet position. The spectre of another Marikana in the farm sector now hangs over Labour Minister Mildred Oliphant, prompted to a large extent by Ms Joemat-Pettersson’s reckless assurance to violently striking farm workers that the sectoral minimum wage would be reviewed forthwith, and that they would not face charges, despite having caused millions of rand in damages. “Two weeks ago [Middle of July 2012 – ed], Tina Joemat-Pettersson, the agriculture, forestry and fisheries minister, announced the donation of R800-million to Zuma’s Masibambisane rural development programme at a ­government function in Qumanco in the Eastern Cape. A department official told the Mail & Guardian this week that in doing so Joemat-Pettersson had in effect diverted the R100-million budget for the department’s Zero Hunger Programme to Zuma’s project. The Zero Hunger Programme is a government initiative to support smallholder farmers and food ­security in rural areas. Over Monday 26 to Friday 30 November an international panel of scientists will be conducting an annual review of the analyses used to provide scientific advice for the management of South African fisheries. This review takes the form of a workshop to be held at the University of Cape Town (Mathematics Building Room M212, 9 am to 5-30 pm daily). Four leading international fisheries scientists make up the review panel. They are Carmen Fernandez (International Council for the Exploration of the Sea, Copenhagen), Mauricio Ortiz (International Commission for the Conservation of Atlantic Tunas, Madrid), Andre Punt (University of Washington, USA) and Tony Smith (Chair, Commonwealth Scientific Industrial Research Organisation, Australia). Discussions will focus on methods to determine the size and sustainable yields from South Africa’s line fish, south coast rock lobster and squid resources. For the last, deliberations will include the resource implications of a proportion of this fishery being allocated for use by small scale fishers in next year’s rights reallocation process. Attention will also be given to the computation of allowable catch levels in South Africa’s largest fisheries, those for hake and for sardine and anchovy. These computations rely on input from regular surveys of abundance carried out by the research vessel Africana. The calculation of appropriate catch adjustments necessitated by the cancellation of recent surveys by this vessel will be discussed. While most discussions will be fairly technical, at 3-30 pm on Friday 30th in room M304 of the Mathematics Building at UCT, the panel will present their findings and recommendations at a lay level, and thereafter answer questions from the audience. Minister Tina Joemat Petterson: Who is Lying Now? So Mr Lionel Adendorf, departmental spokesperson for the Department of Fisheries (“DAFF”), was quoted in the Friday Argus newspaper (16 November) as stating that the Minister had nothing to do with the decision to abandon the lobster Operational Management Procedure (“OMP”) and the recovery plan and the decision to maintain the TAC as unchanged was an internal DAFF decision “based on a variety of factors, including scientific research, economic and ecological considerations as well as employment creation”. Now we can say without doubt that Mr Adendorf is not only being dishonest but is talking absolute nonsense. Firstly, DAFF (ie the Acting DDG) took a decision recorded in writing on 29 September 2012 to reduce the TAC by 9.72%. Once that decision was taken, it could not be re-taken in terms of South African law. Therefore, even on Mr Adendorf’s dishonest and flawed version, the “decision” to change the TAC is unlawful and invalid. Secondly, there is no scientific basis, let alone any economic or ecological considerations to support Mr Adendorf’s flawed contentions. The scientific and ecological evidence is clear. The OMP must be followed and that OMP required a reduction which was accepted and confirmed by the Acting DDG of DAFF on 29 September 2012. However, Mr Adendorf must now show us the scientific evidence he and Tina Joemat-Pettersson have that support an unchanged TAC as being beneficial to the sustainability of rock lobster stocks. Make no mistake, Mr Adendorf raised this and we will now be demanding this evidence. Further, we know for a fact that no economic or social studies were undertaken to determine whether a 9.72% TAC cut would result in job losses or any other adverse socio-economic consequences. But again, we will be demanding these studies from Mr Adendorf. 2. The socio-economic studies you claim show that an unchanged TAC will not result in job losses and other adverse socio-economic consequences. In this regard, we are most interested to understand what will happen – socio-economically that is – when lobster stocks plummet to below 3% of pristine and area closures are required or when TAC cuts of upward of 20% are required (or does the department’s new “science” show that lobster stocks are healthy?). What will happen to the WCRL industry when WWF-SASSI, which is now almost obligated to, list WCRL on its red-list and what will happen if north American markets close their doors to SA lobster because of sustainability concerns? Will this not lead to massive job losses and the effective shutting down of the lobster industry? Or did you you not bother to consider these socio-economic considerations? Unfortunately, this is the result when political expediency is allowed to trump science, the rule of law and rationality. And it is happening all too often now. The ball is now urgently in the WCRL Industry’s court. Will industry move to protect the resource and its right holders and the thousands of jobs it sustains? Watch this space. “An excellent new amendment we present in this Bill today is a legal mandate for the issuing authority of licences and permits to defer a decision to issue a permit if the applicant is under investigation for contravening the Biodiversity Act in relation to a similar restricted activity. Take for example the case of Dawie Groenewald who faces over 1700 charges for among other things racketeering, money laundering and dealing in rhino horn. He was after being arrested able to apply for new permits. The magistrate did initially prevent certain activities, but the period expired, and the issuing authority did not have any legal basis to not issue new permits upon application despite the investigation not having been concluded. The amendment in this Bill would prevent a similar situation in the future. 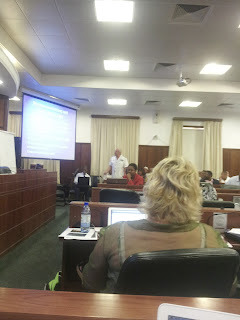 During the course of the Committee’s deliberations on the Draft Amendment Bill, the Department of Environmental Affairs sought to sneak in a tiny but important amendment pertaining marine biodiversity and in particular sought to empower the Minister of Environmental Affairs to make regulations aimed at regulating the Boat Based Whale Watching and White Shark Cage Diving sectors under the Biodiversity Act. 2. The proposed amendment essentially seeks to undermine the Western Cape High Court’s finding against the Minister of DEA in Airjaws Africa CC v The Minister of Water and Environmental Affairs & Others (Case No. 18839/2011). Although that case is presently being appealed, the judgement is quite clear on the fact that the Minister of DEA does not have the authority under the Marine Living Resources Act to regulate the WSCD and BBWW sectors. Not only does this authority escape the Minister of DEA under the MLRA, more fundamentally, the judgement holds that it is certainly not clear that the President sought to give the Minister of DEA this authority under the 29 January 2010 Proclamation. 3. There are presently regulations regulating BBWW and WSCD, which were promulgated under the MLRA. The legislature cannot permit the creation of public confusion which will certainly result should there be two sets of laws regulating these sectors; one under NEMBA and another under the MLRA. Further, the legislature would be acting in violation of section 97 of the Constitution and the separation of powers doctrine pertaining to the President’s Constitutional authority to transfer functions and powers to any member of the executive he sees fit. “If any conflict relating to marine living resources dealt with in this Act arises between this Act and the provisions of any other law, save the Constitution or any Act expressly amending this Act, the provisions of this Act shall prevail”. 4.2 With respect to section 77: There are presently regulations in force which have been promulgated under section 77 of the MLRA which regulate the BBWW and WSCD sectors. 5.3 The MLRA is amended which will in itself require a separate public consultation process to permit clause 5.2 above. In the end, the problematic amendment was not included in the final Amendment Bill as all members of the Portfolio Committee agreed with the DA’s submissions. Feike has been advised that the SAS Africana will now not sail today and in fact may not sail at all. What is almost certain is that the combined arrogance and utter incompetence of DAFF and the Navy will mean that this final pelagic research cruise will have to be abandoned. The abandonment of the cruise will certainly result in a substantially reduced pilchard TAC for 2013 and this will necessarily result in job losses in pilchard factories and on purse seine vessels. In addition, those that will be lucky enough to keep their jobs should expect lower catching bonuses as a result of a reduced catch limit. We can only once again blame this debacle on the increasingly destructive and incompetent Minister of Fisheries, Tina Joemat-Pettersson. Her failure to act as a responsible Minister and fulfill her legal obligations under the Marine Living Resources Act has meant that repeated offers by the pelagic industry to pay for and conduct the final research cruise with an industry sponsored vessel have been spurned. There is little doubt that the Minister’s conduct is an affront to good governance and would amount to a violation of the objectives and purpose of the MLRA and industry must surely consider suing her for losses. But she should also be held morally liable for the socio-economic hardships that will result once people start losing jobs in the pelagic industry. It is incredible how this ANC-led government has been allowed to comprehensively ruin economic sector after economic sector; from mining, to agriculture and fisheries… and that is just in the past few months. Minister Claims TAC Allegations are "Lies"
The Business Day this morning reports that Minister Joemat-Pettersson’s response to Feike’s allegations against her that she irresponsibly and unlawfully interfered in the determination of the 2013 lobster TAC is that these are just “lies”. She fails to substantiate why these allegations are “lies”. Of course the SA public is regularly met with such a standard response by government hacks and ministers when they are found out to have done something wrong. Its “LIES” I tell you! We await a statement alleging racism as their defence too. If our allegations of irresponsible and unlawful interference are all “lies” then perhaps the Minister should assist with the truth by explaining what the TAC for the WCRL fishery is and why it has not been announced with less than 24 hours to go the start of the season for all fishing zones south of Zone A? The commercial lobster fishing season for Zone A (Port Nolloth) actually commenced on 15 October! We note that bizarrely the recreational TAC was published but no commercial TAC for the lobster fishery. And as everyone in the industry knows, the TAC for the WCRL fishery is determined at a “global” level first – ie the entire TAC is determined for all sectors (commercial, small-scale, recreational and interim relief). Each sector is then allocated a proportion of the global TAC. In other words, one cannot set the recreational TAC without having set the TAC’s for the other sectors in the WCRL fishery as well. If one considers the recreational TAC, it remains unchanged at 183 tons, which was a surprise to the recreational fishing sector representatives as they were under the impression that the TAC would be cut by about 9%. Their fishing days have been reduced from 67 days last season to an effective 57 days for the current season commencing on 15 November 2012. In fact the initial indications and discussions were that the TAC would be reduced by 20% because of massive illegal fishing attributed to the interim relief sector. If we recall, fishing by this sector was halted earlier this year because of massive fraud and illegal fishing. The Department, we understand, puts the quantum of illegally harvested lobster at about 8,000 tons (cf to a TAC of 2425 tons). We also understand that the current Acting DDG of Fisheries (in his capacity as the authorised official to determine TAC’s under the MLRA) signed off on the WCRL TAC on 29 September 2012, directing a 9% cut in the commercial lobster TAC. So, Minister where is this TAC determination? Why has it not been published? Feike understands that the SAS Africana may sail tomorrow (14 November 2012) but the vessel has not been fully repaired. We understand that a replacement fuel pump or filter has not been installed. We are told that she will sail tomorrow because of the intense pressure on the Navy to get the final 2012 pelagic research cruise back on track. However, our advice is that she will almost certainly have to return to port within a week for further repairs. The abalone TAC remains unchanged at 150 tons despite scientific advice that the abalone fishing Zones A to D (Gansbaai to Kleinmond) must be closed to fishing if any recovery in abalone in these zones is to be achieved. The Minister once again ignored scientific advice and kept the TAC unchanged at 150 tons. It is also understood that poaching continues to escalate at alarming levels. Feike has learnt that the Minister of Fisheries directly interfered in the setting of the lobster TAC by acting contrary to the critical West Coast rock lobster recovery plan. Although much vaunted in Parliament as part of the department of fisheries’ “successes”, the implementation of the West Coast rock lobster recovery plan and the lobster Operational Management Procedure (“OMP”), has essentially been tossed out of the window by the Fisheries Minister, Tina Joemat-Pettersson. Feike has been informed that the Minister’s commitment to the wanton destruction of our fisheries sector continues with apparent gusto. Durring last week, and subsequent to months of consultations and discussions between the Department’s scientists and managers and the West Coast rock lobster industry association (representing commercial and artisinal fishers), the recreational fishing sector and the “interim relief” sector, it was agreed that a 9.6% cut in the lobster TAC is required to ensure that the fishery is able to recover from the present appalling levels to slightly less appalling levels over the next decade. Lobster biomass is presently at about 3% of pristine. The recovery plan seeks to re-build stocks to a shocking 5% of pristine in the next ten years. Despite reaching consensus, we understand that one right holder (yes, 1 right holder in a sector of more than 1000 right holders) was unhappy and approached the Minister directly. We are informed that the Minister then intervened and instructed an official at DAFF to not amend the lobster TAC for the 2012-2013 season. The consequences of this egregious and irresponsible conduct are substantial and long-term. The effective abandonment of the OMP and recovery plan will mean that subsequent lobster TAC’s will have to reduced by 15% and more for sustained periods. This will almost certainly result in adverse socio-economic consequences, including job losses and increased coastal poverty along the west coast. Despite protestations during the November 6 briefing to the Portfolio Committee on Fisheries by Rear Admiral Teuteberg that the damage caused by the apparent minor error of getting sea water into the fuel tanks(!!) would be repaired by Thursday last week (and then by Saturday), it now emerges that the vessel will not be repaired and ready to sail for at least 2 weeks which will almost certainly result in the abandonment of the critical small pelagic year-end cruise. The failure to conduct this research cruise will certainly result in a substantial TAC reduction which will result in job losses in the pilchard and anchovy sectors. Feike also understands that under the command of the Navy, the SAS Africana has become rat and cockroach infested. Showers on board the vessel no longer work. Naval and DAFF officials barely have a working relationship in place. The Navy requires a number of additional crew on board resulting in the Africana carrying more than 60 people. She normally carries about 50 crew and specialists researchers on a research cruise. The additional crew means that a number of researchers and scientists now sleep on the floor. Coupled with the filthy state of the vessel and the lack of a working relationship with the Navy, we understand that a number of researchers are refusing to continue on board the vessel.